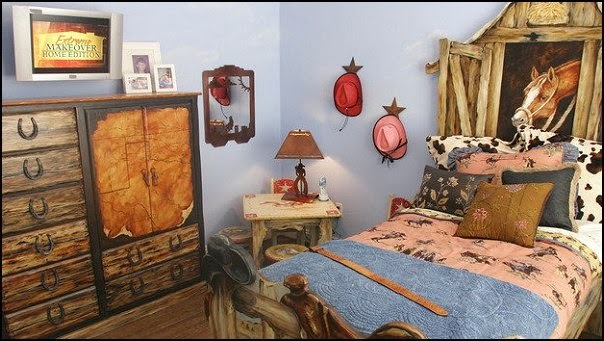 Load up your western chuck wagon with unique rustic western themed decorations and create a fun bedroom for the little buckaroo. 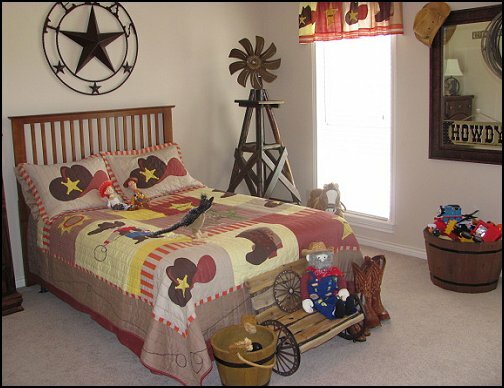 You don't have to be a ranch owner or cowboy to enjoy living in an authentic Western-style home. 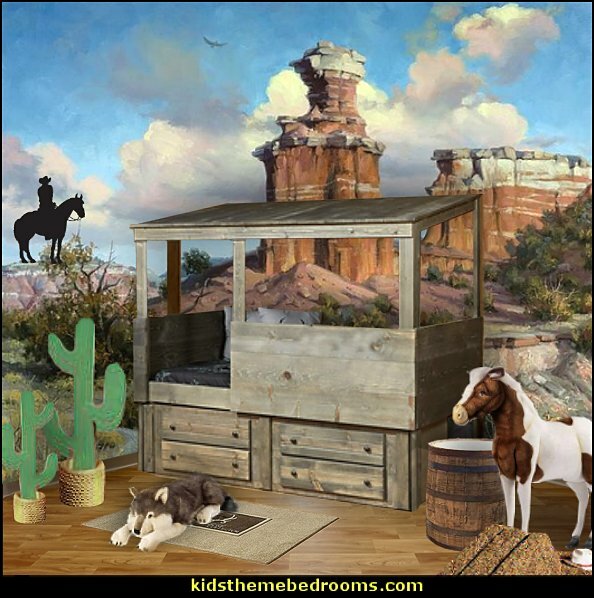 You can easily create a unique Western home, whether you live out on the plains, in the countryside, or in the big city. 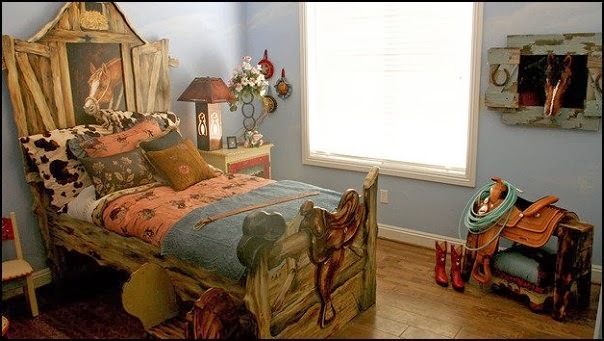 Rustic homes and cabin walls can feel under dressed with just a coat of paint or bare wood. 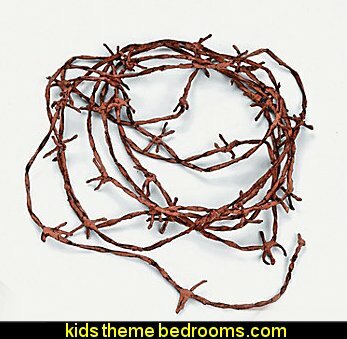 This rusty, spiked cord is soft to the touch, but will definitely put a "sharp" touch on any Western-themed area! 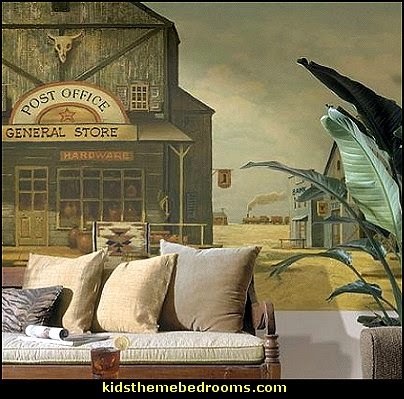 If you want to create a truly decadent, head-to-foot rustic look, accent bedroom walls with wallpaper murals, showing a variety of rugged wilderness, western, and countryside scenes that truly bring the great outdoors in to your grand lodge or log cabin. 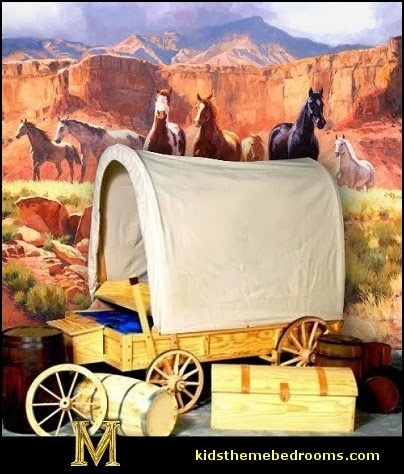 Covered Wagon Twin Bed will allow your little pioneer to go on nightly adventures traveling to the prairies. 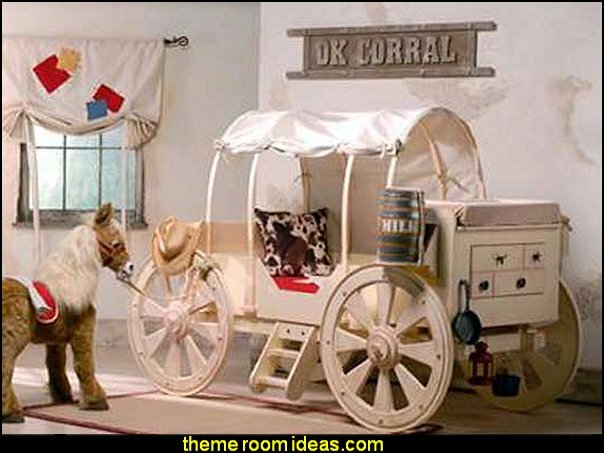 Authentic looking with a real canvas cover, Amish made wheels and a buggy seat in the front, your lil' cowpoke will have a place to fantasize by day and dream in at night. The attached storage chest is the perfect place for all the treasures needed for the long adventurous journey. Rounding 'em up for bedtime will be 1, 2, 3! 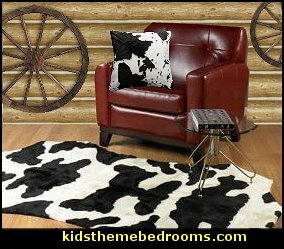 This big ol' chuck wagon is hand crafted for big adventures, giving your cow boy or cow girl a dream come true. 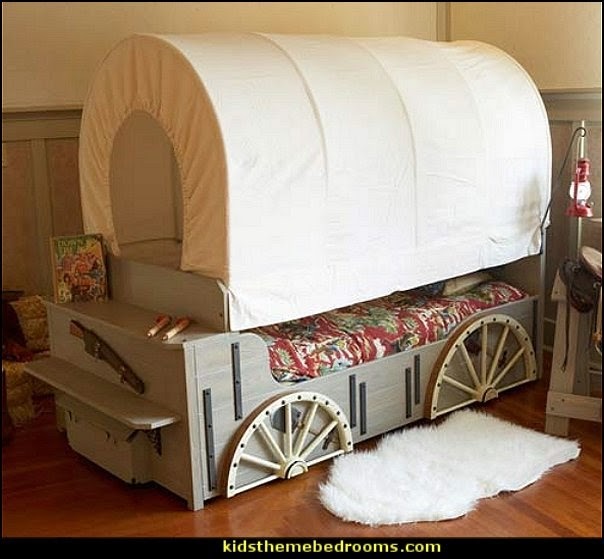 The fine details, leather touches and sliding canopy allows your child's imagination to run wild. 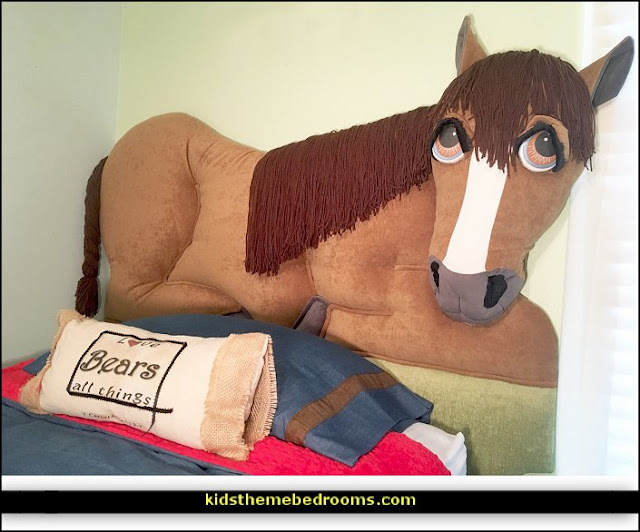 It's finished on all sides for safety and can be placed anywhere in the room. 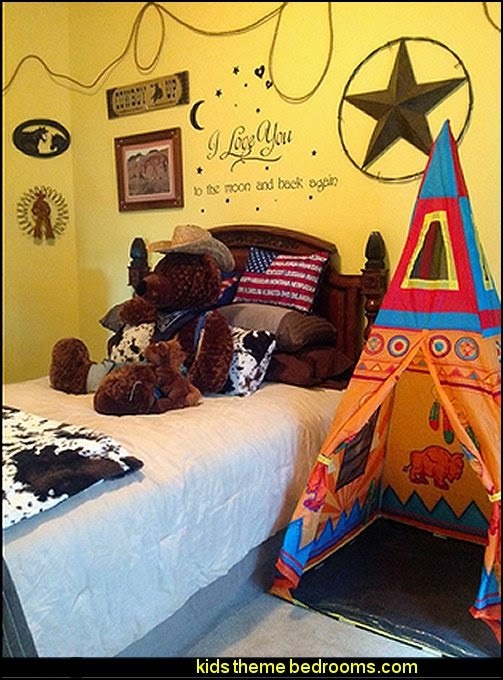 Made of durable and flexible materials, ensuring a quality bed that can withstand the rugged terrain of a trip out west! 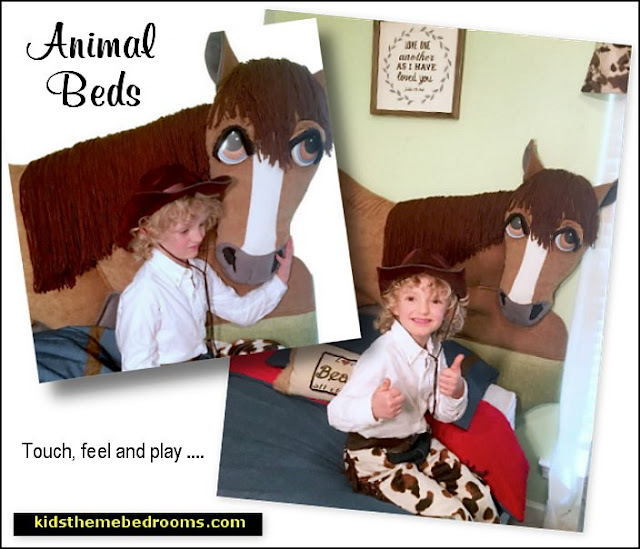 The Precious Toddler Animal Beds have a French Cleat system that wall mounts as an upholstered headboard to grow with your child into a Twin Bed. The eyes open and close to go "Night-Night" with your child so they don't feel they are sleeping alone. 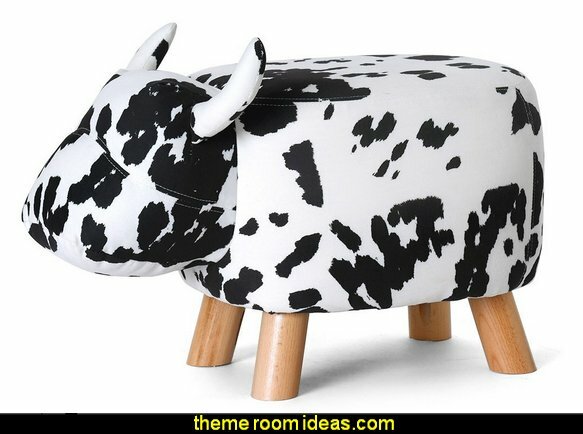 Fun beds for fun kids rooms! 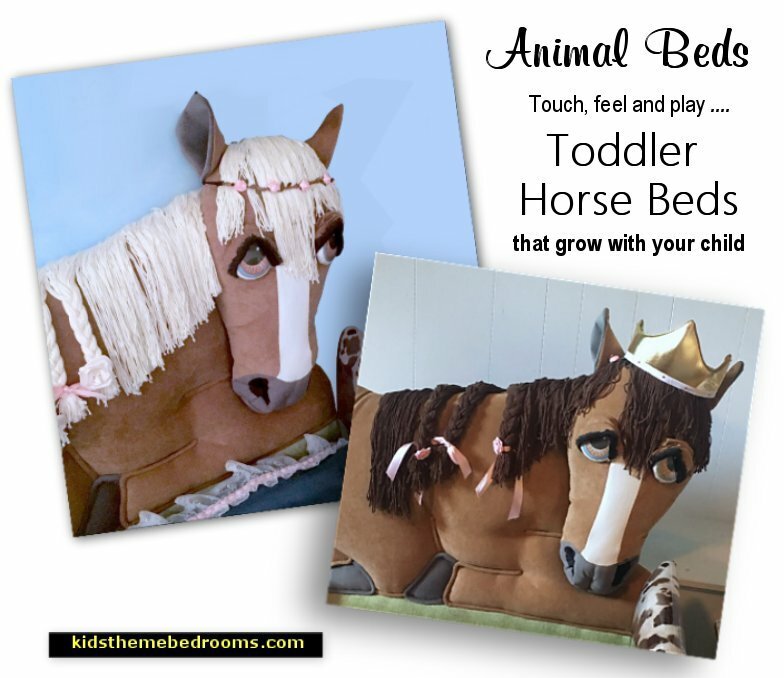 Horse manes come in brown or blonde, the eyes are custom and come in brown or blue. 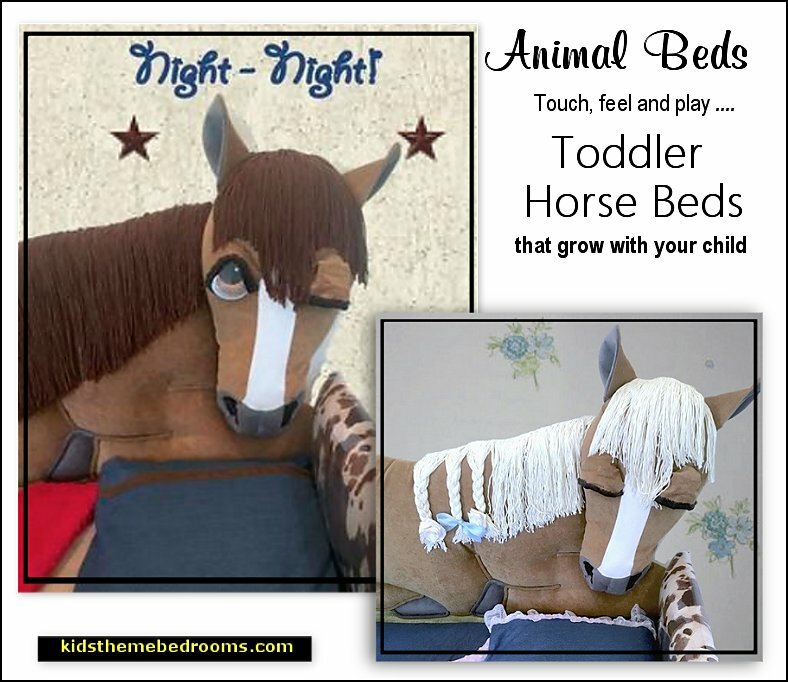 The horse manes are on a velcro system, so you can easily change mane colors and tails for added playtime before bedtime. 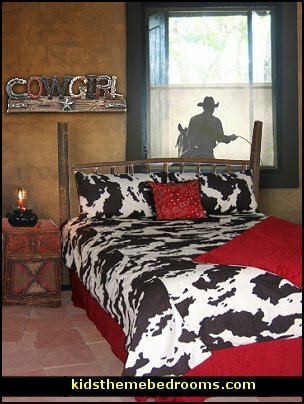 Rich red supple faux suede and two kinds of smooth faux leather give our new Red Rodeo Bedding simple western elegance that’s perfect for your bedroom at home, or take it on the road by outfitting your RV, camper, or horse trailer with the complete bedding set and accessories! 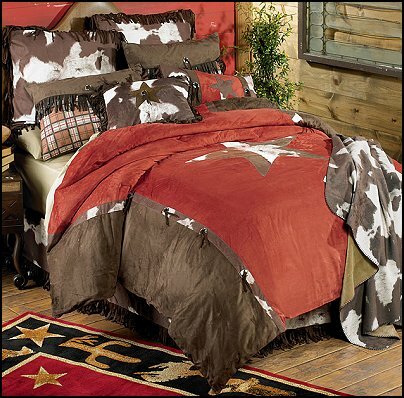 Comforter is red faux suede with brown tooled faux leather and tasseled concho accents. 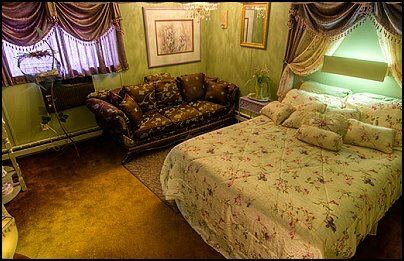 Bed skirt is tobacco-colored faux leather. Euro pillow shams are red faux suede with fringed edging. 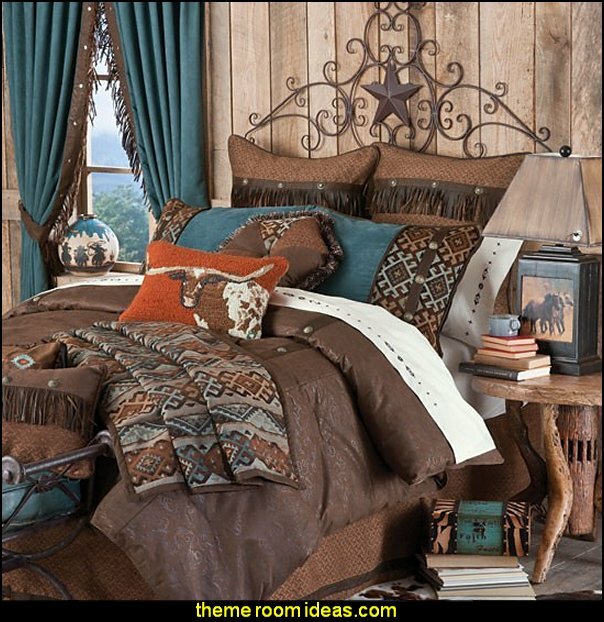 Standard pillow shams are brown and tobacco faux leather with concho accents. 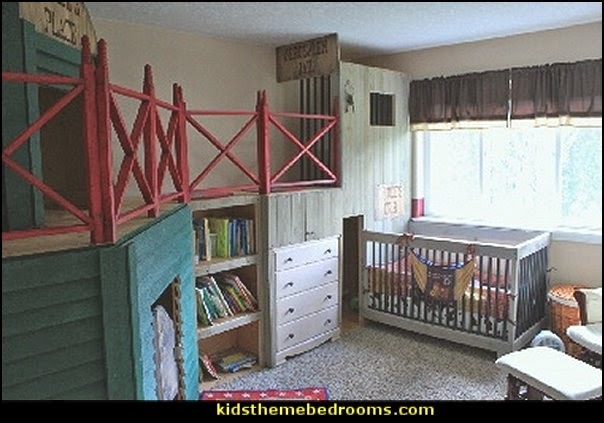 An arresting idea - Let the kids do hard time in .... comfort .... and .... at .... home! 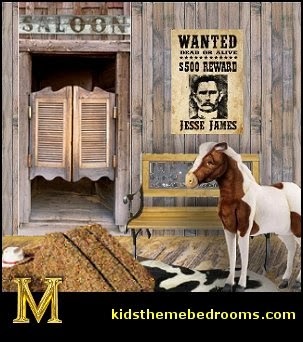 fun and adventure of the Wild West! 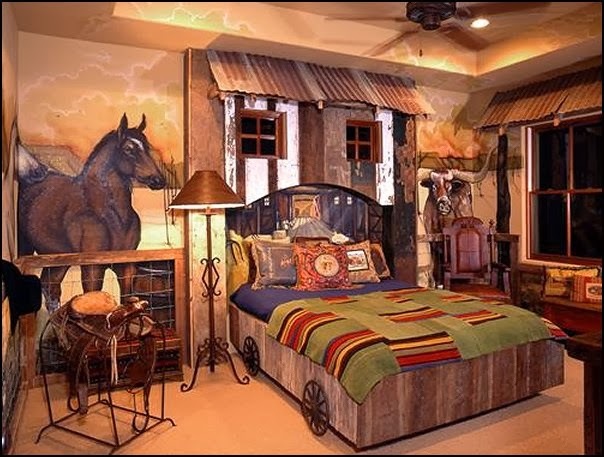 The cool design is bound to be a hit at the ranch with its oodles of cowboys, Indians, horses and cactus. 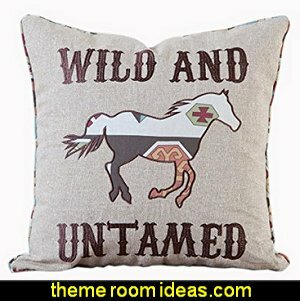 This pillow features a running horse on a sparkling burlap background and reads, "Wild and Untamed." 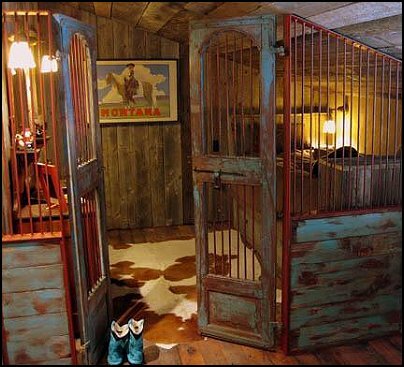 Corral your partner and saddle up this creative equestrian bench with room enough for two! Grand-scale horse sculpture is cast in quality designer resin, reinforced with fiberglass for strength, and hand-painted for authenticity from our steed's shiny mane to muscular haunch. 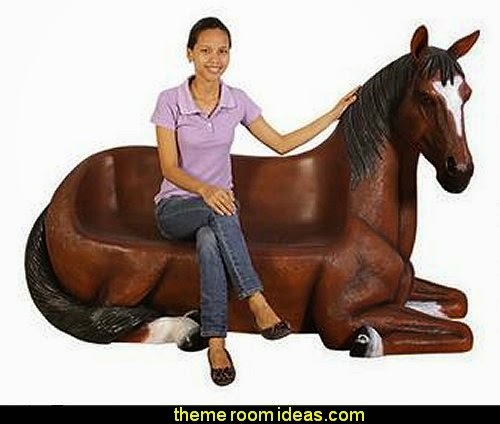 This large-scale, display-quality Horse Bench transforms any home, garden, restaurant or hotel into something truly magnificent! Kids like them, girls like them, boys like them, and everyone likes them! This cardboard cutout of John Wayne with rifle at side stands at a size of 6’2". 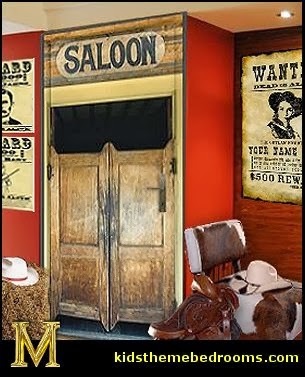 Marion Robert Morrison, better known as John Wayne, brings out the cowboy in everyone. John Wayne was a popular American film actor, director, and producer. Wayne is a Hollywood legend and an icon now. 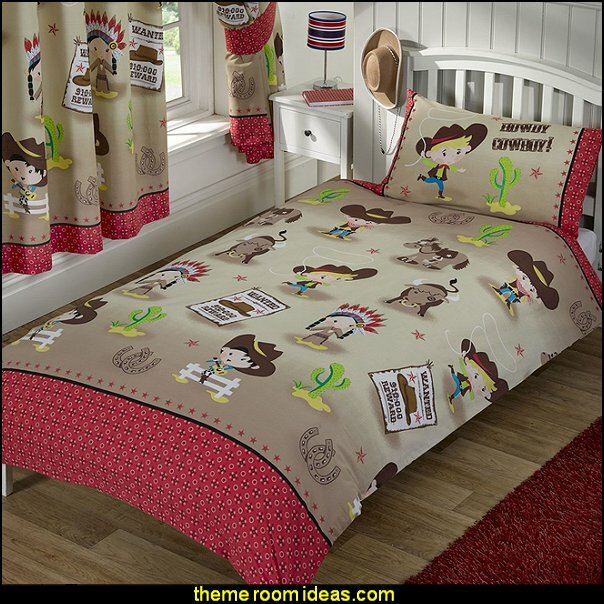 His works are still celebrated today, and his fun Wild West theme is perfect for any bedroom and party! 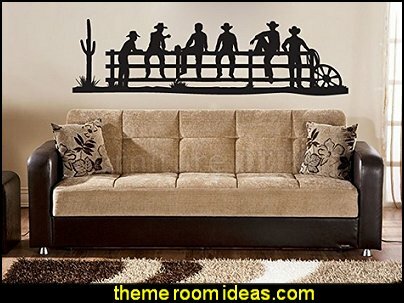 Some people think of western furniture when they think of rustic furniture. 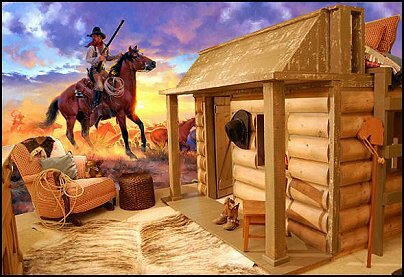 Others think of cabin furniture, country furniture, log furniture or lodge furniture. The truth is that rustic furniture is all of these things. At its simplest it is furniture that reflects a more down to earth feel. 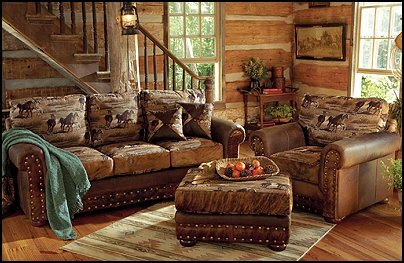 Rustic furniture is furniture that you would more likely see in a camp, a lodge, a cabin, a ranch or even a national park building. 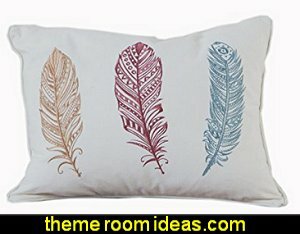 It is made typically by artists and craftspeople and typically employs the use of sticks, antlers, twigs or logs to create a rustic feel. 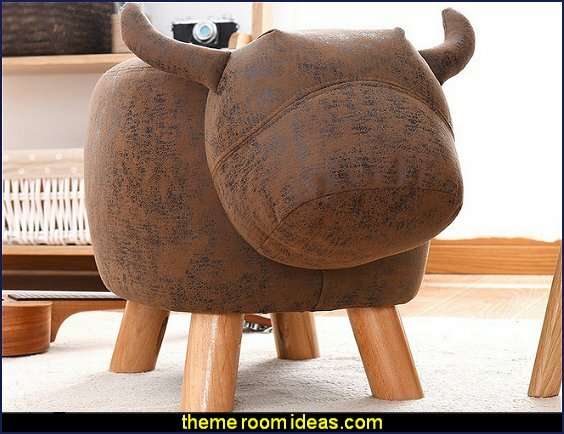 This type of furniture essentially uses what was available to crafts people back in the day. 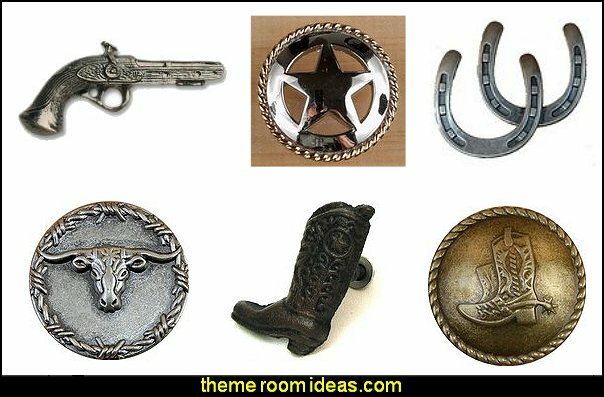 Rustic accents for the country decor, western decor, cabin decor, rustic home decor, lodge decor - nature and wildlife themed fish decor, moose decor, bear decor, antler decor or deer decor. 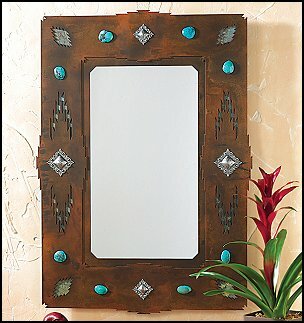 Decorate the walls and hallways of your home with elegant rustic mirrors either wood-framed or wrought iron-framed mirrors, with faux antlers, authentic hickory logs, or reclaimed barn wood. 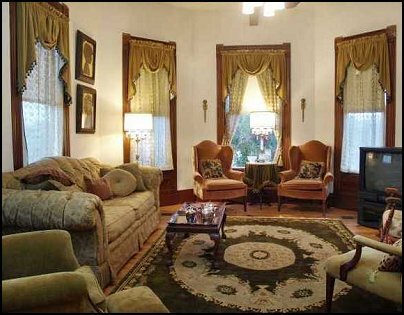 It's hard to imagine a high-end ranch home or Old West inspired getaway without a fine western chandelier hanging prominently in the great room, foyer, or dining room. 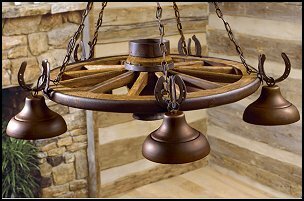 Artfully crafted western wrought iron chandelier lighting will highlight and enhance the quality of your fine western decor and ranch furnishings. 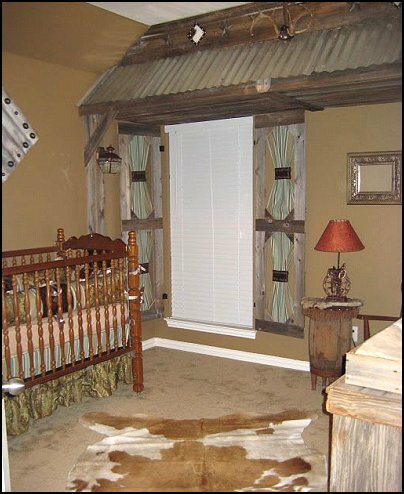 The windows in your western home aren't just for letting in the sun and enjoying the view of your environment; they're also a fresh palette waiting to be decorated and dressed in full western elegance to match the rest of your beautifully designed home. 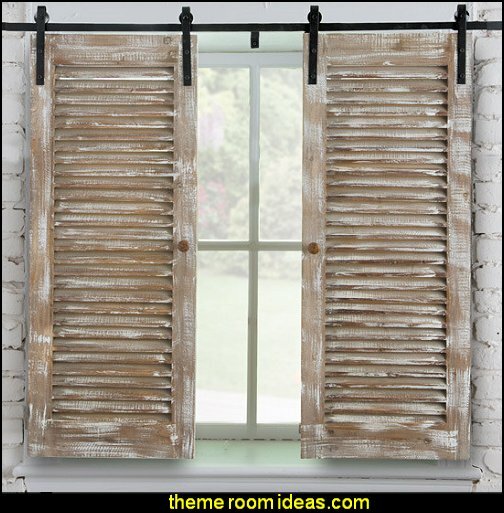 Rustic themed, wrought iron or animal themed drapery hold backs and curtain rods with extra decorations of greenery to give it a pop of the outdoorsy feel. 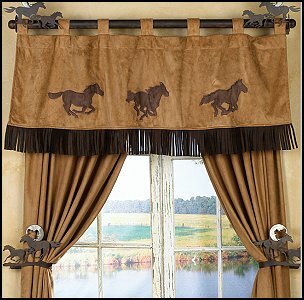 For added western feel, suede curtains, faux leather fringed curtains, wooden pelmets. Add western spirit to your child's bedroom with the Cowboy Bedding. 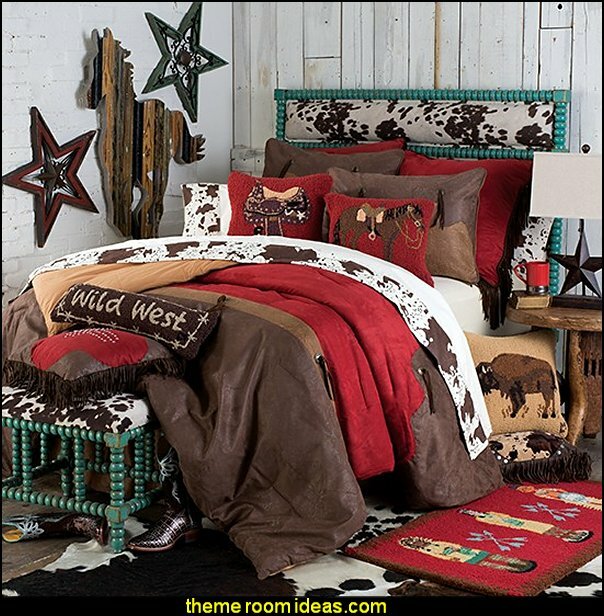 Western Throws and Cowboy Covers. Cowboys like the soft life too. 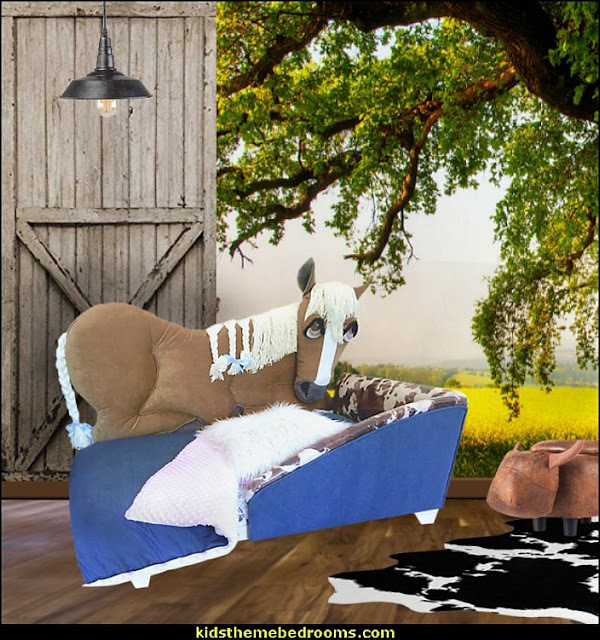 After a raucous day on the range, even the roughest cowhands enjoy relaxing on comfy furniture with plush western throws and fleece blankets. Admirers of country western design understand that decorating floors with quality western floor coverings and southwest area rugs is as essential to a room’s western theme as are the other fine ranch furnishings above the floor. Even the smallest of western throw rugs, rag rugs, country braided rugs, or wool rugs can make all the difference between a common ranch design and an elegant mountain estate. 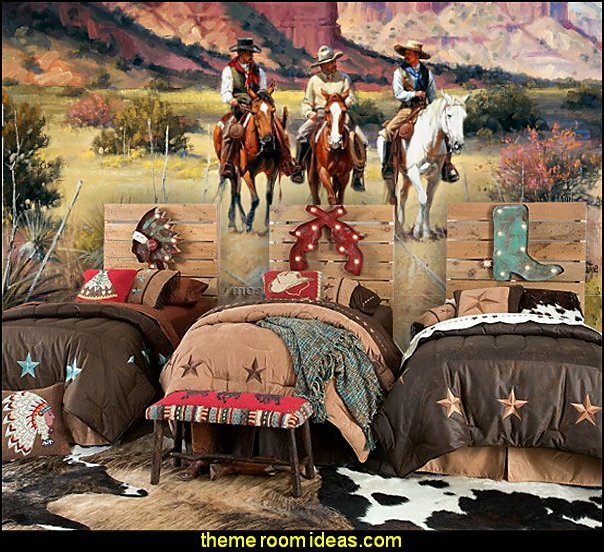 Add western elegance to your floors with western rugs, cowboy rugs, southwestern area rugs. 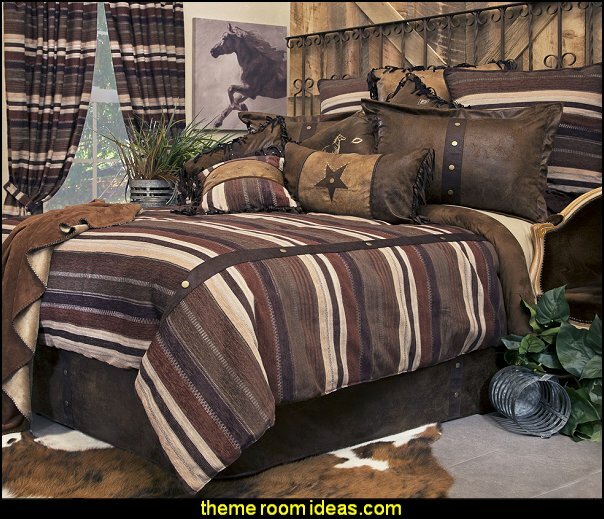 Add a ruggedly traditional touch to your ranch home with tanned hides, buffalo skins, hide on hide leather, and buckskin hide for a unique western touch. Try draping one of our luxurious tanned leather hides over the back of a couch or chair, or use a durable authentic cowhide rug as a one-of-a-kind floor covering. It's often the smallest details that make a room's decor and style truly stand out. 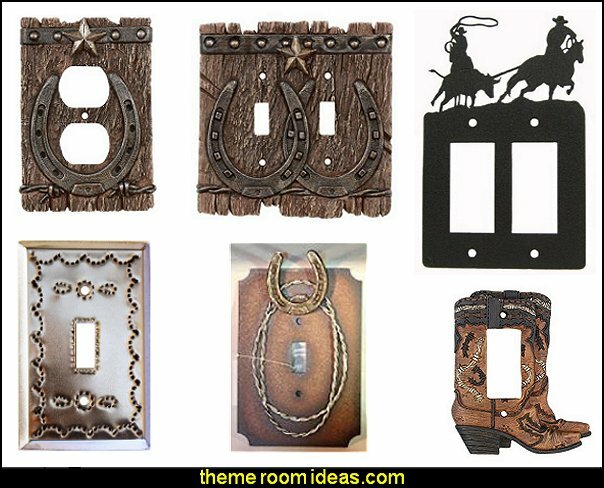 Western switch plates, outlet covers and rustic drawer pulls could be just the details you need to top off your ranch style home decor. 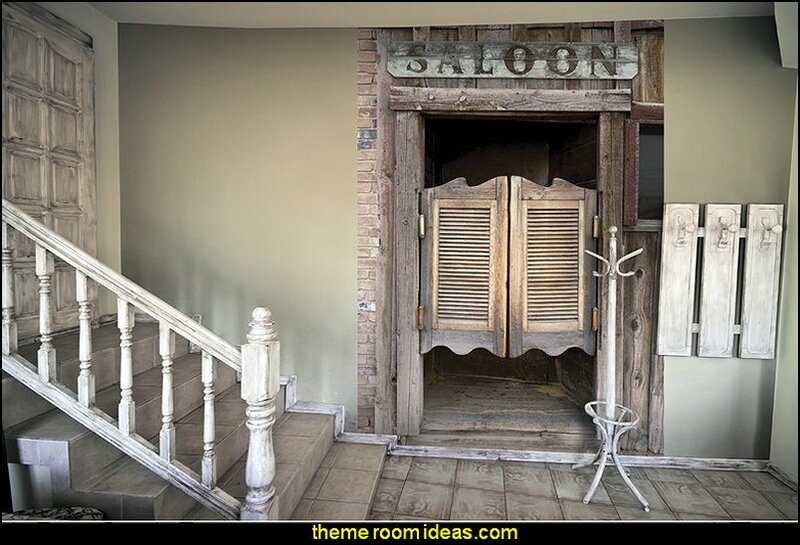 Spectacular western style! This premium-quality western bedding is fit for a kingor a cowboy! Smooth, supple fabrics are adorned with rich embroidery and faux leather fringe. The soft, thick comforter is covered faux suede with faux leather strap details. 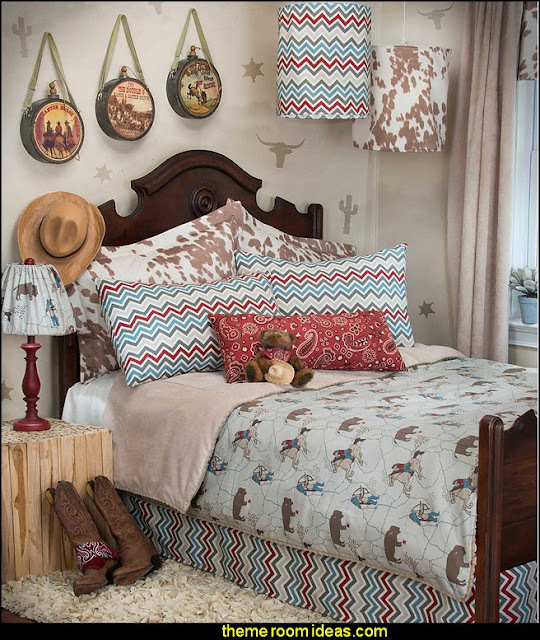 Old West Stripe by Carsten Lodge Bedding covers the bed in a classic pattern. The horizontal stripes are the focal point of the collection with faux leather complimenting the design. Introducing decorative fringes, trims, and pieced stitching the decorative accessories and shams take the pattern to a more luxurious setting. 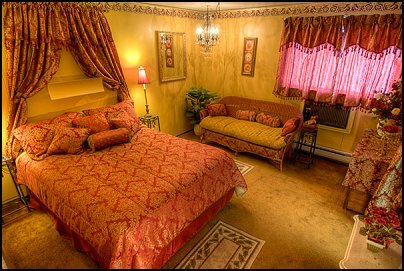 Euro shams, decorative cushions, coordinating bed skirt add layers of color and texture to the bed. 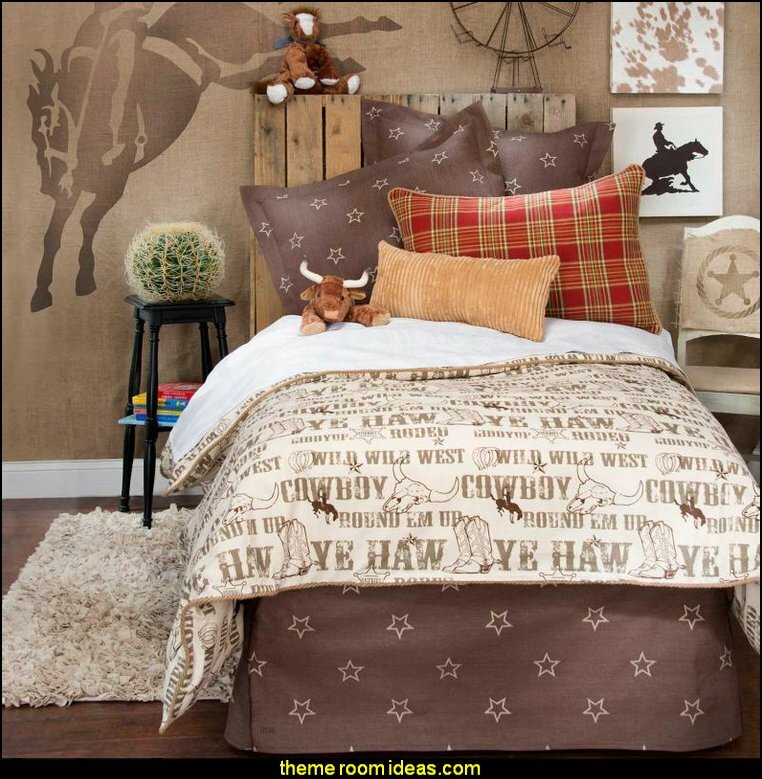 Available decorative cushions to complete your bed are Old West Stripe, Old West Diamonds, Embroidered Horse, Two Tone Star, and Tobacco Fringe Euro Sham. 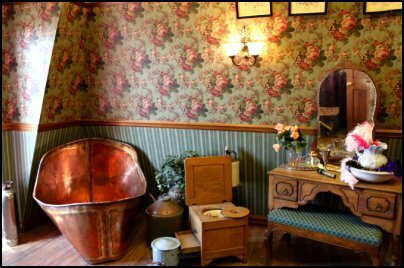 It's often the smallest details that give a room it's individuality and character. 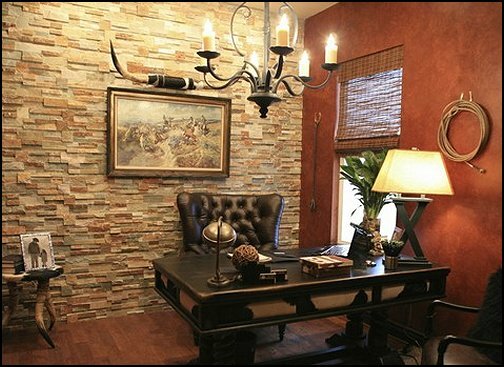 You may start out your western or rustic interior designing with the larger furnishings and accessories, but it's the little rustic accents and country decorations that flesh out the empty spaces and give a room its unique charm. 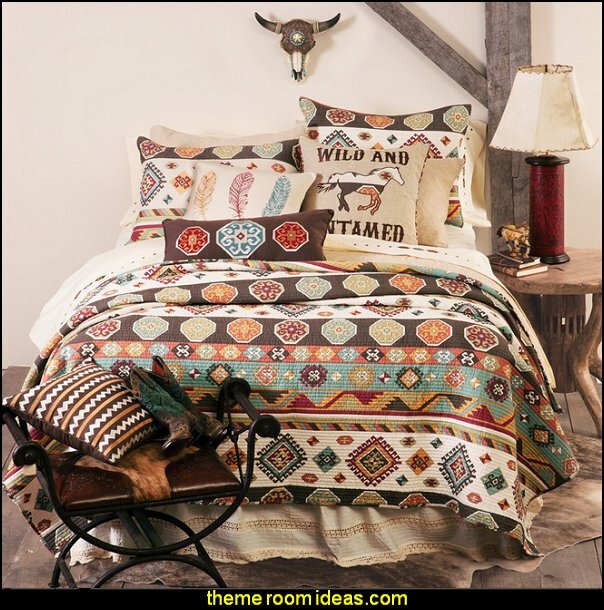 Hints of western home decorations, expressive country home accents, cowboy decor, and wildlife accessories are what you need to complete your rustic home in style. Western desk clocks aren't just functional timepieces; they can be sculptured works of wildlife art. 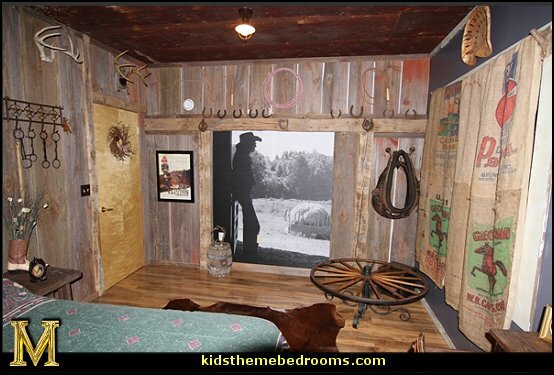 materials, including reclaimed barn wood, birch bark, authentic leather, and willow twigs will add a lovely touch to your home's rustic or western design. 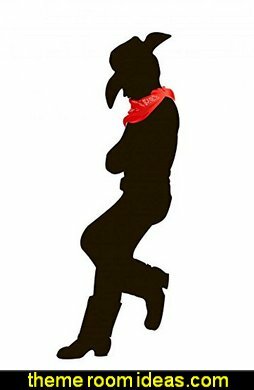 Western sculptures cowboy statues, and Native American figurines will transform an ordinary home into an elegant ranch art gallery. 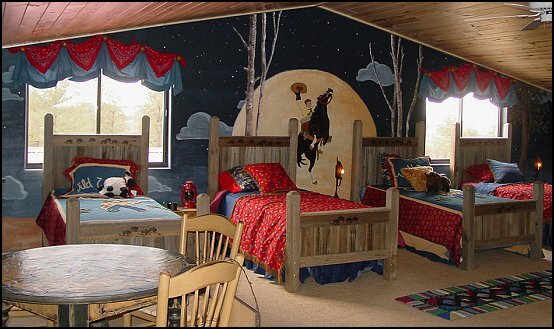 You don't need to be a cowboy to appreciate western art, Native American Art, and cowboy art. Old West Town Mural - Burgundy. This half-wall wallpaper mural is printed as one piece and is un-pasted. It is easy to install and creates dramatic impact in any room. Detailed hanging instructions are included. 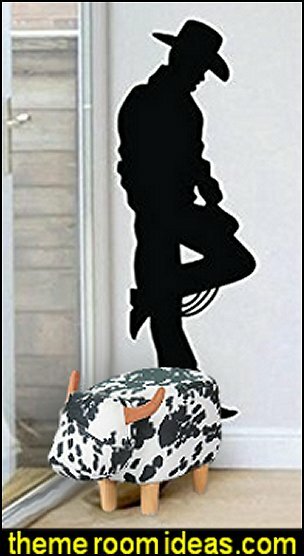 This wall mural is custom made and comes with the FREE option to add a name or short message. You will be contacted, when your order is processed, so that you can provide your customization information.